Deep breath. It looks like the EU will give the U.K. a two-week delay to the exit date to allow Theresa May to get the situation sorted out and avoid crashing out of the bloc with no agreement, which would incidentally probably look a little like this. Those jitters are clobbering the pound and a petition to revoke Article 50 has comfortably secured seven-figures of signatures. And EU leaders are apparently losing faith in May and comparing the process to Beckett. Oh, and more companies are triggering their Brexit plans too, according to the Bank of England. Brexit is driving GBP pairs. 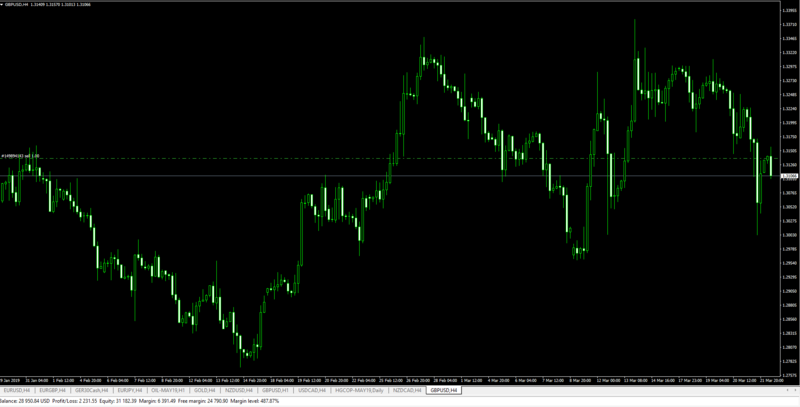 Cable recovered 140 pips from 1.30000. On the smaller charts, bearish 5.0 continuation pattern is completed at 1.31500 -1.31600. On the upside 1.31800 remains as strong resistance and is capped by SMA 100 EMA 50. We like to wait and see a firm closing above 1.31800 to add long positions. Our targets will be 1.32200 and 1.33000 near term. Current near-term overview of the pair is bearish and as mentioned above Bearish 5.0 Continuation pattern is completed. Area of the entry 1.3145-1.3160. Stop Loss of the short trades should be set above 1.31830 and targets of the pair 1.3122 and 1.3090. Update: Shor trade reached the target. We take profit and wait for 1.30600.